Sam Pastor is now a veteran player with Tennis Los Angeles. He moved down from Northern California, in the San Francisco Bay area, to LA. Sam is passionate about sports and started working at a non-profit organization specializing in training and placing youth sports coaches. When he’s not playing tennis he likes to travel, cook and take pictures. Hi Sam. We'd like to hear some of your thoughts and experiences playing in Tennis LosAngeles.com, a division of the Tennis League Network franchise, and to learn a little more about you. To start, how long have you been playing tennis? What got you started, as well as what has kept you going? 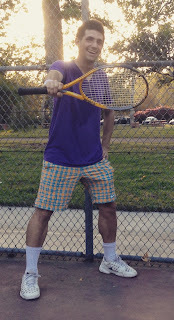 I started playing tennis in high school, but to be honest, I've played WAY more tennis in Tennis LosAngeles over the last couple of years than I ever did growing up! Tennis, in general, is a great game because it demands both physical and mental toughness. You have to be fit so that you can run for hours and hit the ball with consistency. But to win matches that is not enough. You must also be have mental toughness because big points are stressful. Also, tennis is a bit like chess. As the match progresses it's important to identify your opponents weaknesses and find ways to exploit them. Which league are you a member of and how long have you been participating in it? Also, how did you end up finding out about your league? I’m a member of Tennis Los Angeles. I’ve been playing 6 months at the Advanced level (3.75), but I've been a member of Tennis Los Angeles since January 2014. I first learned about Tennis League Network online, and I wanted to find a league that was competitive but also fun! And I didn't have the money to join a tennis club. Glad to hear that! And how often are you playing, in general and with the league? Around 3-4 times a week. Now that you’ve played a couple dozen matches in the league, would you consider any of your Tennis LA opponents rivals? I play against a core group of people who live nearby. On Saturday mornings I like to play with Tynie Pukprayura. He is a 4.5 and I've lost every time we've played but each time I get better. If it wasn't for playing with Ty I don't think I would have done so well in the most recent playoffs. This season I made the playoffs on the very last day of the season. In that match I lost the first set but stayed calm and won the second before taking the match in a third set tie breaker. I made the playoffs as the 14th out of 16th seeds. After knocking out the 3rd seed in the first round I moved onto the quarter finals where I matched up with the same guy I had beat to make the playoffs on the last day of the season. I won the second match too and moved onto the semifinals. In the semifinals I traveled to Cheviot Hills, a fancy neighborhood on the Westside, where I played the #2 seed. The match was close but I lost 6-3, 5-7, 6-3. I feel really good about this season and hope to improve on my result in Spring #2. In the time you’ve been playing, what has made this league stand out from other tennis experiences you’ve had? I like how I have lots of different people to play against. Everybody is fun to talk to and everybody has a different playing style. My favorite part of this tennis league is how everybody is competitive but friendly. We all want to win but we want to win the right way. I'd call this healthy competition. It's amazing how much more exercise I can do when thinking about "how to win" rather than "how many more laps." When it comes to pro tennis, who are your favorite pro players? Why? My favorite player to watch is Serena. It's amazing watching her serve and hit ground strokes. My game most resembles Novak's. I hit the ball consistency, move my opponent around and use short angles. Definitely a worthy comparison. And thank you Sam again for taking the time to do this interview. Keep up the good work!